See the official Brunswick Laboratory test results documenting Seven Essentials fabulous ORAC rating. Hundreds of other polyphenols, phytonutrients and tissue regenerators and oxygenators such as Gamma Oryzanol, Squalene, Pangamic Acid, etc. RiSoTriene is available as a separate product, as well as part of E7. The main reason to take RiSoTriene instead of E7 would be if one is allergic to one or more of the other components of E7. Kona Deep Sea Minerals - 70 macro minerals and trace minerals, in a bioavailable form that assimilates rapidly and completely (all accounted for in the bloodstream within 60 to 120 minutes). There is no pollution in these deep sea minerals and they are balanced in a ratio that mimics the composition of human blood. Kona Minerals are also available as a separate product. Fiber – several types of natural fiber (it’s not just a single broom for cleaning the gastrointestinal channel, it’s also a tooth brush and hairbrush) that will gently assist your body in maintaining a clean intestinal tract. These fiber materials slow the transit of Seven Essentials through the small intestines to ensure MAXIMUM ASSIMILATION of nutrients. Small Molecule Protein - 56% di & tri peptides, with a molecule size of less than 1,700 Daltons (20 to 100 times smaller than other protein) for complete, 100% assimilation), even in times of stress or with damaged intestinal villi. High in all the essential amino acids required for cell growth and detoxification; and great for extra glutathione (antioxidant) protection. Small Molecule Whey Protein is also available as a separate product. Flash Glanced Vegetables - ten flash glanced vegetables. The vegetables are as assimilable as the raw vegetables are, but are in a delicious Seven Essentials format. Get the equivalent of pounds all the vegetables you don’t regularly eat (cabbage, carrot, spinach, tomato, parsley, broccoli, beet, garlic, Brussels sprouts, kale). Polyphenol rich plant leaves - shown to be very helpful at countering free radicals and cellular degeneration. Probiotic - Prolific, good bacteria Lactobacillus salavarius to protect you from pathogens and help breakdown undigested food and eliminate toxic waste. Adaptogens and specialty nutrients such as organic selenium grown in broccoli that provides additional cellular protection from free radicals plus stress protection from ginseng. Each serving of Seven Essentials contains more raw, nutrients than many people eat in an entire month. Seven Essentials offers the highest per serving ORAC (antioxidant rating) of any supplement on earth. Its ORAC rating is 21,010 units per serving. 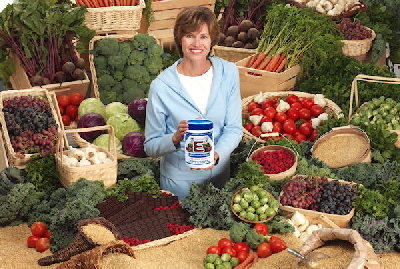 The biggest reason to eat Seven Essentials (E7) is because you’ll FEEL SO GOOD! We are out of stock on all flavors of E7. Our replacement product won't be in stock until towards the end of April 2019. Until then we recommend Risotriene and New Earth Super Food powders. “And the end of all our searching shall be to return to the place where we began and know it for the very first time.”—T.S. Elliot. That place that we need to return to is Nutrient-Dense Raw FOOD! The fantastic nutrition of 11 grams of RiSoTriene (the single most healing food on earth). The equivalent nutrition of many pounds of vegetables (ten different vegetables). But, in this case, they taste great. Highly assimilable Kona deep sea minerals and trace minerals these minerals are a great product all by themsleves. Small molecule protein, fiber, adaptogens, enzymes, probiotics and more. Antioxidants - Seven Essentials has an ORAC rating of 21,010 units per serving! It tastes great and has seven flavors so you can surely find one you like. One serving furnishes more food nutrients than most people eat in over two weeks (including the equivalent antioxidant power of 42 servings of vegetables). You can add virtually any other (objectionable tasting) nutritional powder to it... and it will make it taste good too. Many add, for instance, GPS, to E7. Seven Essentials is a a Food Product—IT IS NOT a Vitamin Product. Vitamins isolates are more lie mini-drugs than they are like food. They don’t come with the assortment of supportive molecules that are found in food. Vitamin C for instance is not just ascorbic acid, but 22 additional supportive molecules plus ascorbic acid. When you only take the isolate, you create a stress on your body as it scavenges the body for the supportive molecules it also needs. That concept NEEDS TO SINK DEEP DOWN INTO YOUR BRAIN because Americans buy more vitamins than all the rest of the world combined, but have among the worst health of all industrialized nations? This is compelling evidence that vitamins really aren’t the way to wellness. What People Need For Health is Nutrient Dense Raw Food! Seven Essential’s nutrients are useable because they are uncooked. 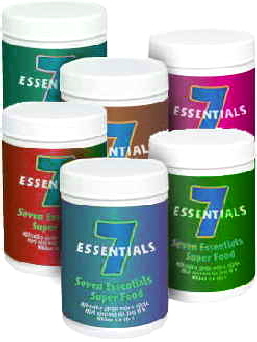 Seven Essentials is perfect as your foundation for health because it is comprehensive, assimilable, raw food nutrition. Most people eat mostly dead food (cooked), and add a few vitamin tablets a week, hoping to stay health. That isn’t good enough to stay health long-term. But, it would take hundreds of dollars and much time and effort to “eat” the original foods that are in Seven Essentials. If you don’t have the time and money for that, then make Seven Essentials your health foundation. With Seven Essentials, no matter what else you do or don’t do each day, your body will be getting optimized nutrition and THAT WILL MAKE ALL THE DIFFERENCE IN YOUR HEALTH. After meeting your foundational nutrient needs through Seven Essentials, we recommend varying or mixing up the other things that you eat and supplement with. Don’t get in the trap of eating the same things each day, because our body can use thousands upon thousands of nutrients, and each particular food has its own set of nutrients. Of course that’s why Seven Essentials is awesome — it contains a great many different kinds of nutrients. It is your sure foundation! You’re busy... too busy to buy, prepare and eat nutritious meals regularly. Seven Essentials is fast and easy and tastes good and contains thousands of balanced by nature nutrients from multiple food types. Your cells will get everything they need in a fraction of the time it would otherwise take. They lack the numerous cofactors needed to be completely useable by the body. Without the missing cofactors, they often create additional work for the body either in dismantling other tissues to obtain cofactors or in simply discarding the nutrients that are missing needed cofactors. With Seven Essentials, you may be able to much better utilize vitamins since Seven Essentials will likely contains the cofactors needed. Again, E7 is especially Important for people who have other things to do than spend hours each day to plan, shop, prepare and eat nutrient dense food. The problem many people encounter when trying to eat more nutrient dense food is the almost frantic pace of our modern lives. Not very many of us have time to plan, shop, prepare and eat nutritious meals. That’s why eating Seven Essentials makes sense. It takes less than a minute to ensure that your body has been fed terrific nutrition so that no matter what else you do or don’t eat that day, you know that your body has been well fed nutritionally. The nutrient dense foods that are included in Seven Essentials are reviewed in the right hand column. It would truly take hundreds of dollars for you to shop for these ingredients as your local health food store. That’s why we created Seven Essentials, to make great nutrition EASY! Most people won’t eat something unless it tastes good. Taste is where Seven Essentials shines. Compare it’s taste to those nasty green drinks on the market. In fact, compare our Chocolate Seven Essential’s taste to your favorite chocolate drink. You’ll be surprised at how good Seven Essentials tastes. And there are four flavors (see their flavor descriptions to below), so that you’ll never be bored. Dutch Chocolate is our most popular flavor and it is very chocolatey. Hint: Some people like to mix it with Natural and create a drink that is less chocolatey with a hint of cinnamon. Natural Berry is our second most popular flavor and gets its flavor from natural red raspberries. Natural is just like it sounds — no flavoring, no sweetener. It’s the perfect nutritional base from which to make your own flavors. Apple Cinnamon is a vegetarian flavor meaning that the small molecule whey protein has been substituted with high quality rice protein. It gets its very delightful flavor from apples and cinnamon and utilizes a new sweetening system of non-glycemic xylitol, stevia and D-RiBose. We are out of stock on all flavors of E7. We won't be resupplied until January 2019. Until then we recommend Risotriene and New Earth Super Food powders. Most people like to make Seven Essentials into a drink. Just mix one or two scoops in 8 to 16 ounces of liquid. Some people, however, like to sprinkle it on a breakfast cereal or mix it into no-bake cookies (with a sugar substitute). We always recommend you use a blender or shake very well, as Seven Essentials contains so much food it doesn’t mix well with a fork. The recommended number of servings per day is 1 to 5 servings a day, depending on your need for nutrition, and whether you are in a health recovery or health maintenance mode. We have had people live in Seven Essentials for up to a year, with virtually no other type of food intake, and completely resolve numerous health issues. See some of our recommended recipes. Question:Why does Seven Essentials cause me to feel satisfied, energized and good so quickly, within just a few minutes of taking it. Answer: There are several reasons. Many of the ingredients in Seven Essentials are predigested or otherwise ready for virtually instant assimilation. Tests have shown that our deep sea minerals are entirely within the blood stream in less than two hours. The main ingredient of Seven Essentials is RiSoTriene, which is a natural powerhouse of natural blood sugar balancers, antioxidants, cellular healers and energy providers. In fact, RiSoTriene contains Pangamic Acid, which was a secret of Russian athletes for many years. Seven Essentials is balanced virtually perfectly and because these all arrive at your cells at the same time, your trillions of cells all get fed and energized together, without any of the extra work that vitamin isolates cause to occur. So, you feel nourished, peaceful, and capable to take on the tasks of the day without any slow down such as when missing nutrients have to be cannibalized from other parts of the body. Mix one scoop of Seven Essentials in eight ounces of liquid. Diabetics omit fruit or juice. Electric blenders and Smoothie machines are a delicious way to use ice to thicken Seven Essentials to “milkshake” consistency. The Seven Essentials Shaker is fast, convenient, and portable. Chocolate is hard to improve, because it has such a fabulous flavor, but Rice Milk, Coconut Milk, Almond Milk, Yogurt, Coffee or plain Milk can be used. Practice makes perfect! I like to put 2 scoops in a smoothie machine with a tray of ice cubes and a cup of liquid, and the extra energy keeps me going from morning to night. All the same liquids mentioned above and also wonderful with any fruit or juice to make a smoothie. Diabetics should avoid fruit and juice, and use like the Chocolate above. Extra special with warmed (organic) chicken stock. Try with warmed tomato juice or V8 (low sodium), being careful to have the temperature under 112 degrees. (Not so hot to burn your mouth in order not to damage the enzymes.) Milk or water are fine. The Natural can also be used as the Veggie suggestions. It is wonderful with heated canned stewed tomatoes (for spice lovers, try RoTel Tomatoes). I add it to anything that you’d love old-fashioned “GRAVY” with by combining plain yogurt and Natural Seven Essentials stirred together at the last minute, and swirled through, and poured on your meats or vegetables. It is perfectly seasoned for sauces, and salad dressings. A GREAT Beef Stroganoff! A favorite light supper is Seven Essentials bowl of yogurt mixed with fresh berries, (blueberries, raspberries, strawberries, blackberries), and almonds, walnuts or pecans, and add unsweetened coconut, if you’d like. Yum. To Support Brain Health - fighting free radicals in of itself helps prevent brain function loss, but also Seven Essentials is a great source of brain response nutrients including carotenoids (alpha and beta-carotene, lycopene, lutein and zeaxantine), lecithin, choline, folic acid, inositol, betaine, L-Taurine, phospholipids and all the Amino Acids. To Increase Energy - energy boosting nutrients include lipoic acid, pangamic acid (Russian athlete’s “edge”) and squalene (a tissue oxygenator also found in shark cartilage). To Help Balance Blood Sugar & Nutritionally Help Manage Diabetes - high blood sugar levels are the most damaging component of the Standard American Diet (SAD), but fortunately, Seven Essentials helps in this regard by helping to transport blood sugar out of the blood into the cells with natural, soluble fiber, glutathione precursors, alpha-lipoic acid, natural B-Vitamins and the minerals magnesium, chromium and vanadium. To Help Lower Blood Pressure - the RiSoTriene component of Seven Essentials helps reduce the adherence of cholesterol plaque to arterial walls (increasing flexibility) and providing electrolytes (potassium, magnesium and calcium) that help optimize blood pumping action. To Help Inhibit Cancer Naturally - with its potent antioxidants, the most potent of which are well known: quercitin, carotenoids, selenium-grown broccoli, ferulic acid, glutathione precursors, tocotrienols, inositol, lycopene and polyphenols. To Help Prevent Heart Disease - with many natural ingredients that help improve cardiovascular function including Coenzyme Q-10, flavonoids, folic acid, Omega-3, magnesium and many others. To Help Burn Fat and Help Build Lean Body Mass and Recover From Exertion Faster - RiSoTriene, inside Seven Essentials, is the highest source of Gamma Oryzanol in nature and has been found to have a lipolytic effect, meaning that it helps to burn fat. This in combination with natural ferulic acid helps build lean muscle, improve strength and reduce recovery time after exertion. To Help Fight Depression - almost nothing overcomes depression better than a feeling of energy and wellness coming from your body. This is what Seven Essential does best is to increase the feeling of wellness. To Help Maintain Healthy Cholesterol Levels - components of Seven Essentials, such as Gamma Oryzanol, Phytosterols (including beta sitosterol), Insoitol and Omega 3 work to lower LDLs (bad cholesterol and raise HDLs (good cholesterol). To Help Improve Sleep - though the initial response to Seven Essentials is one of wellness and energy, because it delivers a full complement of nutrients and minerals to the body, when taking Seven Essentials, people sleep better than ever before, because the stress in the body reduces when nutrition increases. To Help Control Stress and Decrease Problems Associated with Menopause - Seven Essentials is highly effective at reducing symptoms of stress. Those who have compared Seven Essentials to drugs that are used to control menopausal stress say that Seven Essentials does this job better with no side effects. Several studies performed with Gamma Oryzanol in Japan also indicate improvement with menopausal related issues such as headaches, low back pain, fatigue, dizziness and appetite loss. As usual, nutrition wins over synthetic vitamins or drugs. To Help Create Healthier Hair and Skin - the overall nutrition of Seven Essentials aids in tissue growth and repair. Especially they help counter hard skin, psoriasis and skin issues related to free radicals. To Help Protect Vision - eyes require good nutrients in order to avoid cataracts and macular degeneration. Gamma Oryzanol in Seven Essentials helps eyes repair themselves quickly because it is a cell proliferant. Additionally, lutein, quercitin, lycopene, and zinc all help promote good eye health. To Help in Weight Loss - because of the abundant nutrition in Seven Essentials, many people lose their cravings for unhealthy foods and for snack foods. Others replace nutrient empty meals with Seven Essentials. In both cases, this leads to healthy weight loss. To Help Enhance the Immune System - studies done in the U.S., Japan and India all show that tocotrienols, a major natural component of Seven Essentials, promote T-cell development and thus immune system enhancement. Also, the glutathione precursors in Seven Essentials, help the immune system function. To Help Decrease Thyroid Problems - two Japanese studies show that gamma oryzanol had a normalizing effect on TSH (thyroid stimulating hormone) with those suffering from low thyroid function (hypothyroid patients). Seven Essentials has a normalizing effect in general upon the endocrine system. To Help Prevent Kidney Stones and Osteoporosis - the RiSoTriene component of Seven Essentials has been shown in both animal and human studies to reduce calcium excretion through the kidneys (calcium excretion is linked to the formation of kidney stones). Lessened calcium excretion is also helpful to avoid osteoporosis. To Help Inhibit Ulcer Pain - Gamma Oryzanol has been shown to have significant anti-ulcer activity. To Help Relieve Sugar Cravings and Mood Swings - the RiSoTriene in Seven Essentials helps those who suffer from blood sugar swings (with resultant energy drops, sweet cravings and irritability). Also, hypoglycemic symptoms such as fatigue, shakiness and brain fog are often relieved within minutes with the great nutrition of Seven Essentials. To Help Cleanse the Body of Toxins - the fibers and essential oils in Seven Essentials provide the means of removing toxins from the body. People who are deficient in oils tend to absorb more oil-based environment toxins, like a dry sponge soaks up water. A healthy body with sufficient oils with instead repel these toxins, much like the oil in a duck’s feathers causes them to repel water. Copyright 2008-2018 Healthy-Living.Org. All rights reserved. These statements have not been evaluated by the Food and Drug Administration. No product mentioned herein is intended to diagnose, treat, cure or prevent any disease. If you are pregnant, nursing, taking medication, or have a medical condition, consult your physician before using this product. except you in consult with your trusted health professional.